*Dancer's Mobility: Her small stature and dancing makes her difficult to strike in melee and she is very acrobatic. *Canny Defense: Because she wears no armor, she has more freedom of movement so that she can more easily move in battle. *Magical Training: She is very intelligent and what time isn't spent dancing or fortune-telling is spent studying her magic. *Fortune Telling: By using her Tarot Deck, she can gain small visions of the future, usually vague or cryptic. *Weapon Focus (Bladed Scarf): She is very well versed in fighting using her Bladed Scarf. *Diminished Spellcasting: Because she incorporates her scarf in her fighting, her spellcasting is slightly limited. *Care-free: She finds many situations difficult to take seriously and lands herself in trouble at times. Can be mouthy and sarcastic. *Can be a bit quick to fighting if provoked. Traits: "For some, their dances pulse with the power of their magic. These dancers incorporate their scarves—embroidered with mystical runes—into their dances, weaving deadly whirling steps with the power of their ancestors." *Spellstrike: Can imbue touch spells into her scarf to cast them on hit. *Spell-Scars: Tattoo-like scars made in her skin can be read from as a scroll to cast certain spells. *Prescient Defense: Striking an enemy gives her a premonition to her enemies' attacks, allowing her to dodge more accurately. *Masochistic Shadow: Animates the target's shadow, causing it to attack it's owner. *Find Fault: Instantly learn of target's weakness. *Raven's Flight: Can transform into a tiny black Raven for a short time. *Armor Lock: Locks enemy's armor joints in place, making movement extremely difficult. *Fire Snake: Traces a line on the ground that ignites enemies it touches, dealing fire damage. History: Miselda was brought up in a poor nomadic family. Her mother was a dancer, but made the majority of her money in other ways... Her father was a drunk, and was often abusive. They traveled, her mother making the money they needed for food, but her father took what wasn't used to pay for their small meals to buy his liquor. 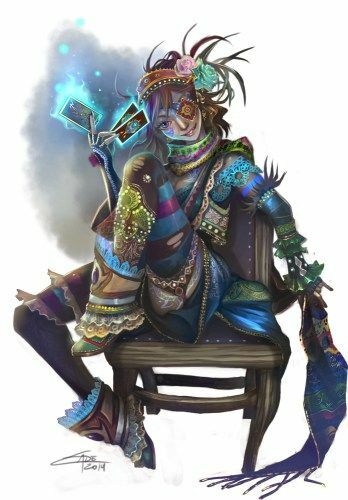 Miselda was very intelligent, and learned the magic she knew by sneaking into the magic academies of the cities they traveled to. Her grandmother was a very skilled Magi, and upon learning of Miselda's interest in magic, her mother told her stories of how she used the magic with her dancing to protect their family. She practiced and studied the art until she could do it herself, and picked up new knowledge quickly. After being caught by a wizard she snuck into the library of, instead of punishing Miselda, he took her on as an apprentice. She learned many new spells and flourished in the academy. She started spending more time away from her family, but still sent them money when she could to help them eat and keep a place to live. She returned to them for a visit during one of her breaks and found out that her father had killed her mother in a drunken rage and fled the city. Miselda was heart-broken, and vowed revenge on her father. She learned new spells even more quickly than before, and began to sneak into the wizard's books forbidden to her to carve some of the more powerful ones into her skin to practice to use at a later time. She started dressing in more extravagant clothing to hide her scars. One of the spells she attempted too early backfired and blinded her in her left eye. The wizard upon seeing the spells carved into her skin, banished her from the academy and put her back out in the streets. She returned to traveling, reading fortunes and dancing for her money, with the intention of someday finding her father.